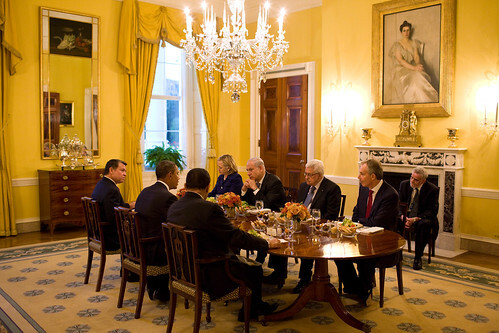 Original Caption: "President Barack Obama holds a working dinner with, clockwise from left, King Abdullah II of Jordan, Secretary of State Hillary Clinton, Prime Minister Benjamin Netanyahu of Israel, President Mahmoud Abbas of the Palestinian Authority, Tony Blair, the international Middle East envoy and former British Prime Minister, and President Hosni Mubarak of Egypt, in the Old Family Dining Room of the White House, Sept. 1, 2010. (Official White House Photo by Pete Souza)"
"So, anyone heard any good jokes lately?" "Okay. Except for Hosni we've all agreed on the seating arrangements."